175g (6oz) small new potatoes, scrubbed and halved 8 baby carrots, scrubbed and trimmed 2 red onions, cut into wedges 2 garlic cloves, sliced salt and black pepper about 2tbsp olive oil a few rosemary sprigs 250g (8oz) cherry tomatoes 125g (4oz) French beans 1 small cauliflower, broken into florets 1×400g (14oz) can butter beans, drained 2tbsp coarse-grain mustard a handful of chopped fresh herbs (eg parsley, chives, basil, chervil). 1- Put the potatoes, carrots, onions and garlic in a roasting tin. Season and add the olive oil, then turn to coat. Tuck in the rosemary sprigs, and roast in a preheated oven at 190ْC (375ْF, Gas 5) for 40-45 minutes or until the vegetables are tender, stirring in the tomatoes about 15-20 minutes before the end. 2- Meanwhile, cook the French beans and cauliflower in boiling salted water for 4 minutes. Drain and set aside. 3- Mix the roasted vegetables with the French beans, cauliflower, and butter beans, then gently mix in the balsamic vinegar, mustard, and herbs. Serve hot. 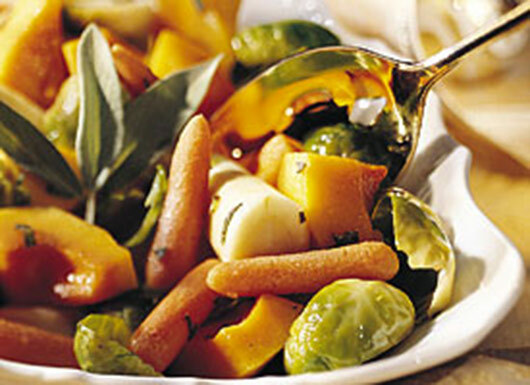 Transfer the vegetables to an ovenproof dish. Sprinkle with 90g (3oz) grated Cheddar cheese mixed with 60g (2oz) fresh breadcrumbs. Return to the oven for about 10-15 minutes until golden.